Rep. Donna Shalala (D., Fla.) on Thursday slammed Sen. Bernie Sanders (I., Vt.) for not calling on Venezuelan dictator Nicolas Maduro to step down, saying, "Maduro is a dictator and must go." "I’ll make it clear, @SenSanders does not reflect the majority of the Democratic Party and our support for Venezuela’s interim president @jguaido and the Venezuelan people. Maduro is a dictator and must go," Shalala tweeted. Shalala's tweet was in response to an interview on Tuesday where Univision's Jorge Ramos asked Sanders, a self-proclaimed democratic socialist, whether he considers National Assembly president Juan Guaido the legitimate president of Venezuela. "No. I think what has to happen right now—I think there are serious questions about the recent election. There are many people who feel it was a fraudulent election, and I think the United States has got to work with the international community to make sure that there is a free and fair election in Venezuela," Sanders responded. Ramos followed up by pressing Sanders on whether Maduro is a dictator and if he thinks he should step down. "I think clearly he has been very, very abusive. That is a decision of the Venezuelan people, so I think, Jorge, there's got to be a free and fair election," Sanders said. In addition to her tweet, Shalala told Politico that Sanders "is not going to be the nominee of the Democratic Party" and that he "has demonstrated again that he does not understand this situation." 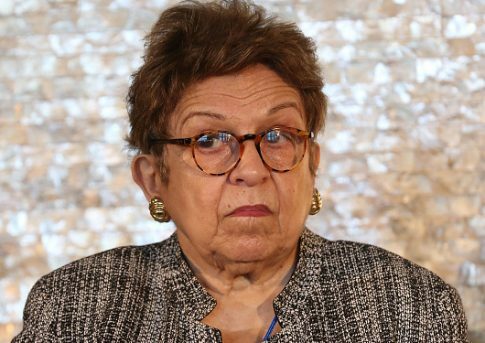 "I absolutely disagree with his imprecision in not saying Maduro must go," said Shalala, who represents Venezuelan exiles in her district and has filed legislation aimed at helping immigrants from the country. Venezuela is in the midst of a Constitutional crisis that stems from disputed elections that occurred last year. Maduro was sworn in for a second term. However, Guaido soon proclaimed he was the rightful leader since the country's constitution permits him to assume temporary power when the president is deemed illegitimate. The United States, most of Latin America, and the European Union recognize Guaido as interim president, while Russia, China, and Cuba support Maduro. In the ’80s, Sanders traveled to Nicaragua. Upon his return, he repeatedly defended the Sandinistas and their leader, Daniel Ortega…. Sanders’ enthusiasm for both Ortega and the Castro regime in Cuba came back to haunt him during the 2016 presidential campaign. Three years ago, during a primary debate against Hillary Clinton hosted by Univision and the Washington Post in Miami, Sanders was shown a video shot in 1985 while he was mayor of Burlington, Vermont, in which he spoke about Nicaragua and enthusiastically described how Fidel Castro had "totally transformed" Cuban society, providing education and health care. After Univision anchor María Elena Salinas followed up, Sanders acknowledged Cuba as an "authoritarian, undemocratic country" but then proceeded to praise the Castro regime, again, for its "advances in health care" (a dubious claim at best). This entry was posted in Politics and tagged Bernie Sanders, Donna Shalala, Nicolas Maduro, Venezuela. Bookmark the permalink.